Before anyone freaks out, or calls this post "click-bait," or persistently tell me that I don't know what I'm talking about (... OK, that last one may be true), it's critical to understand what I'm going to outline in this post and what I am not. What I am not advocating is for the Blue Jays to trade Josh Donaldson, just because. What I am advocating for is for us to examine what the benefits would be in the event that the Blue Jays do decide it's best to trade their MVP caliber third baseman. This will heavily depend on the direction that the Jays decide to go in 2018, which I outline later in this post. There's a not-so-subtle difference between the two and I hope you can recognize the distinction. The title of the post should have already made that clear from the get-go. But in the event that it did not, it was worth explaining. With that, let's get into it. Josh Donaldson has been one of the major bright spots on both sides of the field since being acquired by the Blue Jays in late 2014. He proved to be the standard when it came to playing with grit, intensity, and an overwhelming amount of passion for the game. Being one of two MVP's in Blue Jays history (the other being George Bell), he's become an undeniable fan favorite and a player that any team in the MLB would have been lucky to build around. Having a third baseman who can easily be penciled as an All-Star that provides outstanding defense and offense is something that the Blue Jays would be wise to hold on to for as long as they can. But in the world of baseball, it's well-known that it does not operate in absolutes. 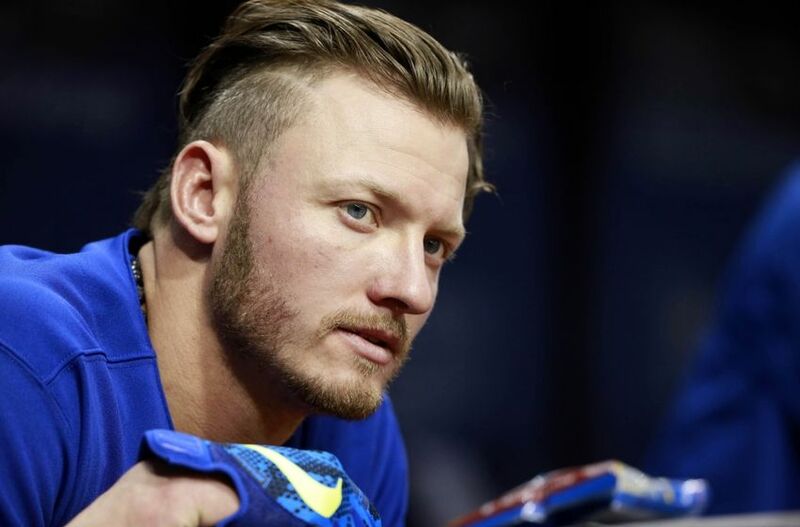 In normal circumstances, it would seem obvious to some that a long-term extension for Josh Donaldson should have already been offered by the front office due to how rare of a talent he is and how such a player could help carry the Jays to the post-season on a yearly basis. It seems obvious simply because during his tenure with the Blue Jays, his numbers provide evidence for it. Numbers do not lie. Yet, when it comes to players that we - specifically as Blue Jays fans - come to adore and cling on to, we don't want to acknowledge what history has taught us. We willingly put our blinders on because we hope a player like Donaldson can be the anomaly and the normal rules of aging and regression simply do not apply to him because... well, because he's Josh Donaldson! And he's a Blue Jay! But when it comes to those that have to make the tough decisions for the benefit of the team's long-term interests (i.e. the front office), the blinders have to removed in order to come to a sound and (close to) objective conclusion, depending on the direction they decide to take the ball club. Let's look at the facts. Josh Donaldson is eligible for arbitration for just one more season; after which, he will become an unrestricted free agent. We assume - and rightfully so - that the Jays intend to hold on to him for the remainder of his contract, thereby paying him around $20 million for the 2018 season (I'm spit-balling). He is currently 31 years of age and is turning 32 at the end of this year. Assuming he stays with the Blue Jays for the 2018 season, he will be on the later side of age 32, or just turning 33 as an unrestricted free agent. The free agent class that he is part of is arguably the best free agent class that we have seen in a very long time - consisting of names like Manny Machado, Adam Jones, Bryce Harper, Carlos Carrasco, Clayton Kershaw, Dallas Keuchel, and Andrew Miller. Knowing what we know about the Blue Jays and their historical reluctance to exceed a 5-year deal (even though at his introductory presser, Mark Shapiro stated that he "doesn't like to operate in absolutes..."), as well as knowing that Donaldson will be in line for a big contract - perhaps his last and only chance at one - it's hard to see these two things meshing well. Of course, it's possible that the Jays offer Donaldson a 6 or 7 year lucrative contract and it's certainly possible that they may even be in the process of negotiating a deal with Donaldson before he becomes a UFA. But when we ignore our strong fandom that we have for the Jays and their players, we have to ask ourselves if this is good for the organization and its goal of being consistent contenders. I'm not sure that it is (notice I did not say that "It's not."). 2018 is going to be a year in which the Blue Jays are going to have to commit to a direction. Right now, it seems that they want to be competitive and push for a return to the post-season, while at the same time replenish and develop their minor league system to build a consistent competitor once the likes of Martin, Tulowitzki, Donaldson, and Bautista (if he's still a Blue Jay) pass the torch. For me, it seemed like this is what Atkins and Shapiro attempted to do this year and, as we have seen, it didn't generate the results we all would have liked to see. Sure, injuries played a role when it came to the woes the Jays experienced and it wouldn't make an awful lot of sense for the front office to push their chips in if they didn't have the healthy pieces that would play a critical role in competing for the post-season. But in order to acquire more pieces to replenish the farm system, it's reasonable to assume that it would mean the Jays would also have to give up something of value on their end. These valuable pieces that would theoretically be moved are also the same pieces that would help lead them towards the post-season. You see the conundrum here. You can't have it both ways. You can't fully commit to a post-season run and fully commit to replenishing the farm at the same time. Going half-in on one and half-in on the other won't lead to the results that are desired either - the "luke warm" approach, as I like to call it. You're either all-in on one, or all-in on the other. I can't think of a team where the luke warm approached has successfully worked. Thus, it really all depends on the direction that the Jays decide to take. 2018 is going to be the year that this proverbial window of opportunity that has been referenced since '15 will probably close, so if the front office intends to fully commit for a post-season run they can't look to acquire pieces to replenish the farm via trade at the same time. Doing so, as mentioned, will require them to part with the necessary pieces to make that post-season push. If they don't decide to fully commit to a post-season run, and they prioritize acquiring young and controllable pieces to build this consistent contender that they aim (and have preached about) to build, then it would require them to move on from pieces that would enable them to make a run at the post-season. As it stands, the only player that would be attractive enough to allow the Jays to acquire such assets via trade is Josh Donaldson. This is the reality. As much as we'd like to play Fantasy Baseball and car salesman, no team is knocking on the door for Troy Tulowitzki, Kendrys Morales, or even Russel Martin. Moreover, these pieces that can reasonably be considered declining assets (two of which I wouldn't bank on playing a full season) won't offer the Jays and their fans the desired return to help replenish the farm. The only chip that the Jays can use to acquire young controllable assets for the future is Josh Donaldson. Right away, I'm sure you're reading the list of players on the Blue Jays roster in your head and you want to respond with - "That's not true! They could also move players like Aaron Sanchez or Marcus Stroman! They'd land huge returns!" Sure. While this is true, this wouldn't be aligned with the goal of building a consistent contender, as both of those players aren't going to cost the Jays a lot in terms of a contract once the two reach arbitration. Seeing as though both won't be UFA's until 2021, it wouldn't make a whole lot of sense for the Jays to move these pieces, given how long they are under contract and can help be a part of the "consistent contender" goal once the young group of now-prospects make their way up the the big leagues. Donaldson, on the other hand, is entering his last year of his contract with the Jays and the concept of the Blue Jays being outbid by a team that doesn't mind exceeding a 5-year contract once he reaches free agency isn't inconceivable to me. Actually, it's almost predictable given the team's history. Moreover, how certain are we really that Josh Donaldson can be this good in two or three or four or five or six or seven years time? Historically, long-term contracts given to players approaching their mid-30's haven't been favorable. I mean, ignore the laundry for a minute and really ask yourself - would you be comfortable paying Josh Donaldson anywhere between $20MM - $30MM a year when he's 35 or 36 or 37? It's not unreasonable or even irrational to assume that he won't be worth that much towards the later end of the deal. You can say that the solution is easy and Donladson can just become a DH when (assumingly) Vladimir Guerrero Jr. becomes the third baseman in 2019 (this is the popular timeline. It's by no means concrete), but you forget that the Jays will also still have Morales, Tulowitzki, and Martin on the team; which the last two probably won't be able to continue to play their current fielding position. Do we really want to pay at least two - and probably three (Donaldson, Tulowitzki, and Morales) - DH's that much money? At that point in 2019, the Jays will already commit a total of $52MM to Martin, Tulowitzki, and Morales, alone. You could also argue that you could move Donaldson and/or Martin to first base, but this ignores the fact that the Jays could (and probably will, if he continues to play/hit the way he has this year) exercise the $6MM club option on Justin Smoak in 2019. Also, Rowdy Tellez may become a thing again. So when you look at the position the Jays will be in, it's really hard to find a sensible way for all of this to work. Again, this all assumes that 2019 plays out the way I have outlined, and that's totally fair. But personally, I'd rather allocate those dollars and use them on younger players that have more years of production than use it on signing Donaldson who may only have 2-3 years of this left. Other clubs may not see it this way and may even have the luxury of being able to afford that risk (not that Rogers can't afford it, but they aren't known for opening up the purse). Thus, as it stands, like it or not Donaldson is really the only conceivable and reasonable trade-chip that the Jays have that will allow them to acquire a return to build on. Of course, nothing is guaranteed and the players that would theoretically be brought back via a trade for Donaldson may be complete and total duds (the Roy Halladay trade, anyone?). But a team takes that risk any time they acquire young talent; whether it be by trade or in the draft. Again, nothing is guaranteed, but it may be a risk worth taking if - and only if - the Jays' post-season aspirations for 2018 seem bleak. But again, this all depends on which direction the Jays decide to go - either push for the post-season or replenish the farm. Don't get me wrong, it's not like the Jays need to make this decision right now. It's not inconceivable to me that they can have every intention of pushing for the post-season at this very moment and fully intend on going that route this off-season. I can see them waiting to see how the 2018 season plays out before making any rash decisions, and that would be smart. In fact, Mark Shapiro has already said that "it's almost a certainty" that Donaldson will be a Blue Jay next season. Yet, if next year the Jays are in the same position that they were at the trade deadline this year and the chances of making the post-season are reasonably low, coupled with having the general feeling that Donaldson is eager to see what he can get in the open market, it might be best for them to pull the trigger. The downfall of doing so, though, is that his trade valuable may not be as high as it is right now. That's not to say that they should do it right now, it's just the reality. Donaldson has been on an absolute tear over the past two months and it seems as though the injury to his calf earlier this season is more-or-less behind him, leaving other clubs to conclude that he's back to form. Yet, what the Jays would get in a trade that involved Donladson this off-season will not be what they would get should they decide to trade him next July. I think this is a risk worth taking, though. As mentioned, injuries played a pretty decent sized part of the Jays disappointing 2017 season. Trading Donaldson now would mean that the front office doesn't have confidence that the bulk of the club has what it takes to reach the post-season and/or are able to stay healthy. Yet, seeing how aggressive they were in signing Marco Estrada to an extension, and given the reports that they aren't done looking to acquire starting pitching, it certainly seems as though the front office folk are serious in their attempts to do what is necessary to make it back to the post-season. It seems that they do, in fact, have confidence in this team - and they should! But it is also reasonable to suggest that if the front office views that it is unlikely that the Jays will reach their goal of playing baseball in October of 2018, Josh Donaldson is going to be a name to watch. 2018 will be a defining year for the Blue Jays. Either the core group (minus Bautista... probably) makes one last push for the post-season, or we'll be seeing a new crop of players that make up the Toronto Blue Jays. Whichever way the season unfolds, Josh Donaldson and his future as a Blue Jay will play a huge role. Again, not saying that the Jays should trade Donaldson. I'm saying don't be shocked if (eventually) he is.